The World Ocean Basemap includes some incredible high resolution data, such as this dataset for San Francisco from California State University, Monterey Bay. Esri’s new release of the World Ocean Basemap reflects an exciting and major change to the basemap’s structure that will make it easier than ever to use. The World Ocean Basemap, designed for marine GIS professionals and as a reference for anyone who wants to view ocean data, now consists of a base layer and a separate reference layer. The base layer includes hydrographic and terrestrial cartography such as submarine canyons, seamounts, and plateaus. The reference layer contains reference information and labels such as soundings, subsurface feature names, and administrative boundaries. Having the reference layer separate from the base layer increases your cartographic options when you use the World Ocean Basemap in your maps and applications. You can use the reference layer traditionally, remove it and use your own annotation and labeling, or layer your data between the base and reference layers. What does this change mean for you? The former version of the basemap will go into mature support [PDF]. The ocean basemap team won’t add new data or make any improvements to the earlier version of the basemap, which will be retired in one year. Even though you have some time to switch your maps and applications to the updated version of the World Ocean Basemap, please take advantage of the new basemap today. When you access the World Ocean Basemap from the basemap gallery in the ArcGIS Online map viewer or ArcGIS for Desktop, you will automatically get the latest version. Both the base layer and the reference layer will be active. You’ll be able to interact with the reference layer like you would with any other operational layer, giving you the choice of whether or not to use it. The island of Java in Indonesia is situated next to some fascinating underwater features, such as the Sunda Trough and the Java Trench. Besides being able to work with the two feature services bundled from the basemap gallery, you’ll be able to interact with the map layers as individual feature services. There are two very easy ways to add the individual layers to your project. You can either search the ArcGIS Online data catalog or access them directly through their REST endpoints. The latest release of the World Ocean Basemap coincided with a recent update to the Esri basemap system. There are two changes for the World Ocean Basemap included with this update. First, the update allows tile resampling in the World Ocean Basemap. This lets most of the “Map data not yet available” tiles be replaced with resampled map tiles from the most detailed level available. Second, the update includes support for Web Map Tile Service (WMTS) access to the World Ocean Basemap. For more information about these changes, please read the ArcGIS content team’s blog post Esri Basemap System Upgrade to ArcGIS 10.2 for Server. As always, the ocean basemap team is excited to hear what you think about these new features. 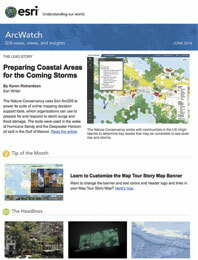 Send us your comments by e-mailing us at OceanBasemapTeam@esri.com. We look forward to hearing from you soon! Caitlyn Raines graduated from the U.S. Coast Guard Academy in 2009 with a Bachelor of Science in Marine and Environmental Science before reporting to the USCGC RUSH (WHEC 723) as a Deck Watch Officer. 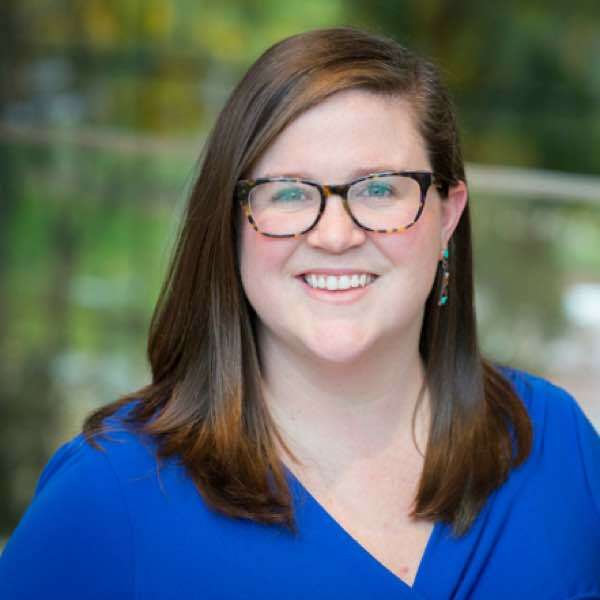 In 2013, she joined Esri as a project manager and technical consultant after receiving her Masters of Science in Geographic Information Systems from the University of Redlands.